Product description: An embellished gladiator with a modern look. I wish these sandals fit but they don't. The foot bed on the 6 1/2 is longer and narrower than expected. But the straps themselves are roomier than expected. Its an odd combination - they're too small and too big at the same time. ..... 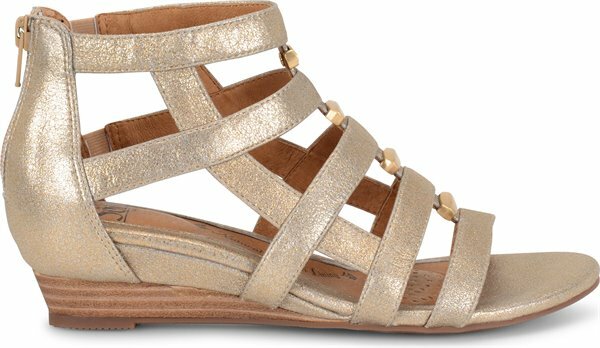 If you have a high instep, or a high-volume foot, these sandals were made for you. They're cute too. Agree with post above. Wore them few times they stretched a lot and the seam under toes start to hurt. Not for all day use but still will wear them. 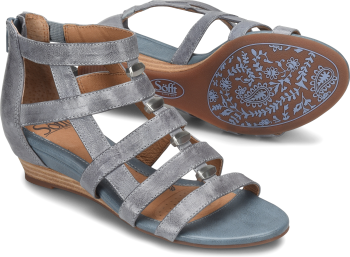 This is my third year in a row buying Sofft sandals. The first two were absolutely perfect -- fit, durability, and style. This year I purchased the Rio in luggage. I was terribly disappointed in the quality of the leather covering the toe. Barely scraping something and the leather tears. This did not happen on prior shoes as I still have (and wear) my old ones. I was also disappointed in the fit. They have stretched out so much in the width that I am uncomfortable walking in them. I will give Sofft another year to bring back the great quality and fit, but I am just not happy with this pair of shoes. 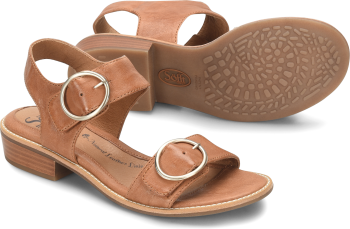 This is my third year in a row buying Sofft sandals. The first two were absolutely perfect -- fit, durability, and style. This year I purchased the Rio in luggage. I was terribly disappointed in the quality of the leather covering the toe. Barely scraping something ad the leather tears. This did not happen prior shoes as I still have (and wear) my old ones. I was also disappointed in the fit. They have stretched out so much in the width that I am uncomfortable walking in them. I will give Sofft another year to bring back the great quality and fit, but I am just now happy with this pair of shoes. Really nice sandals and I am getting many compliments too. They look very good quality, however after wearing them 2x when light raining, the bottom sole part is falling apart. Also the front part is starting to look little beaten. I spent more money then expected, hoping to have sandals for 2 seasons, but it seems like they wont last that long. Hope they are either cheaper or will last longer. Love the sandal have one pair from last year best feeling shoe I had for a long time. I am SOOOOOO disappointed. 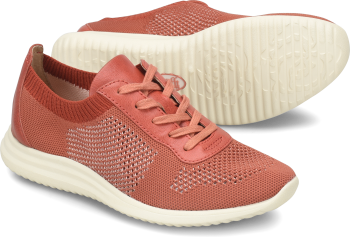 I bought the carmel colored style and the very first time I wore them, the leather on the front edge came peeling off!! Seriously? I expect this brand to be top of the line, high quality and instead was heartbroken. I am picky and this style checked everything I was looking for off the list, fit great, looked awesome, etc etc. So, I brought them back to exchange for another thinking I just had a lemon. NOPE. After first wear on the second set (and I'm wearing them in a white collar office with carpet, mind you), again the leather on the front started peeling. For the price tag, I was beyond disappointed and sadly returned them today. I wish they would have worked out. Sofft - can you PLEASE work on the design of these to be secure so the leather doesn't peel? I bought black Rio sandals! They are so comfortable and beautiful! Love them! Fantastic and comfortable sandals. I wore them couple times and every time I receive compliments. Good quality too. 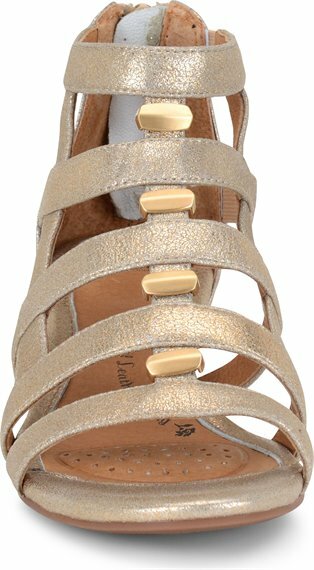 Love this sandal. Wore it the other evening and did some walking in them and they were very comfortable. I have foot issues and it is very difficult to find sandals that fit me and that I can walk in. 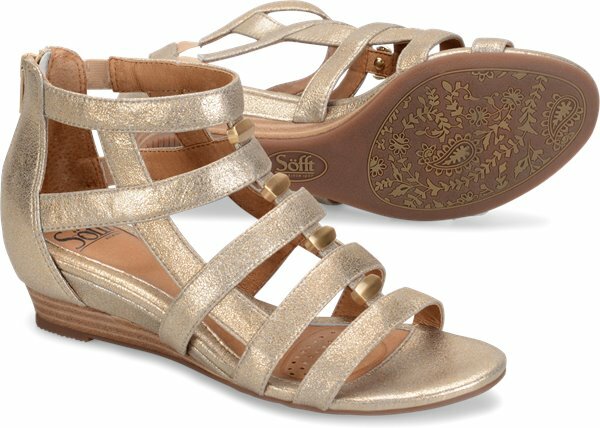 Love Sofft's shoes and will be a customer for as long as they continue to make shoes like this. Thank you. 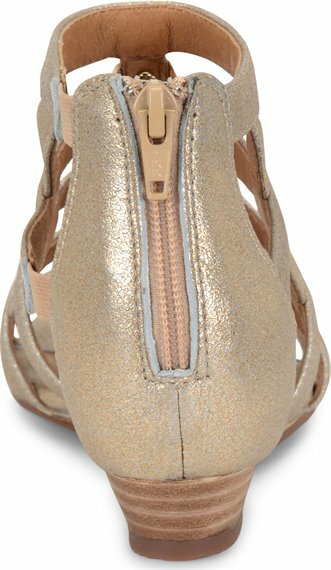 I've had the two precessors to this silver gold zip heel sandal, now i'm going back for The 2017 version ... they are just that comfortable and pretty at the same time, but my other two pairs are worn out from love, so it's time to move over now. Please Sofft, don't ever stop making this sandal! Best candles ever wish you had white.